President Dwight D. Eisenhower, following an act of Congress in 1956 establishing a 2,040-acre park, officially proclaimed the Horseshoe Bend National Military Park in Tallapoosa County. 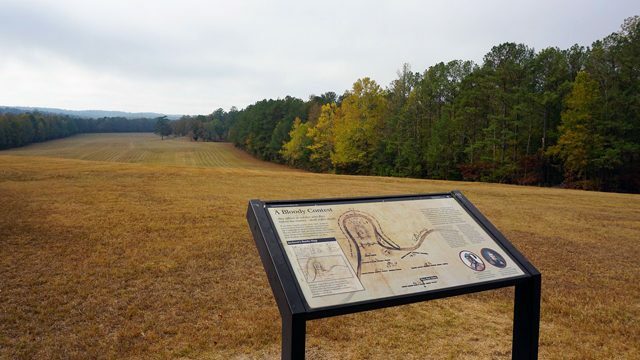 Eisenhower and Congress acted to preserve the site of the battle between the U.S. and Creek Indian nation on a bend in the Tallapoosa River. It was the final conflict in the Creek War of 1813-14, marking Gen. Andrew Jackson’s soldiers defeat of the Red Sticks, led by Chief Menawa. The vision for the national park came out of Alabama Power President Tom Martin’s decision to forego building a dam at Horseshoe Bend and instead donate the land to the federal government. Martin organized an association, serving as chairman, that worked with Alabama’s congressional delegation to draft legislation for the park.